Khun Sivaporn Dardarananda, Vice Chairman, of TISCO Foundation presented a cheque to Khun Vannee Uboldejpracharak, our Director and Secretary, for donation on the occasion of his 60th Birthday. Khun Pichai Chanvirachart, President & Chief Operating Officer of TISCO Bank, has donated ฿ 500,000 to TISCO Foundation for issuing school notebooks to be distributed to needy students on the occasion of 25th anniversary of TISCO Foundation. 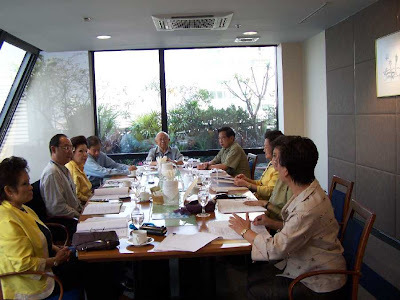 The First TISCO Foundation Committee’s Meeting for the year 2007 was held on January 19, 2007.